Nirmaan Organization is not-for-for-profit organization started by a group of BITS - Pilani University students in 2005 with a passion to make India a developed Nation. Vidya Helpline is one of the flagship projects of Nirmaan started in 2010 with a focus on career guidance to the students and dropouts. The project is first of its kind in our Country and has been life changing for thousands of students across several states. We are here to help you become successful and happeier in your life by guiding you to realize wht you are really good at and help you to take up appropriate careers. In this context I would like to share the Success mantra in your career and life in four simple steps. 1. Identify your interest and choose a career in the area of your liking. All major achievers in the world are those who have very keen interest in what they do and they made their career as their life. Let th motto of your education be "Education is for increased quality of your life but not just for higher earnings". 3. Dream Big in whatever you choose and give your best shot. If you choose to become a doctor aspire to give the best treatment to your patients, If youwant to become a civil engineer, aspire to construct a bridge which can be effectively used by a few generations of people, if you choose to become a chef, aspire to cook the best food to the customers in the entire world. 4. Continuous Hard work there is no replacement for it but Success is guaranteed. I repeat success is guaranteed. 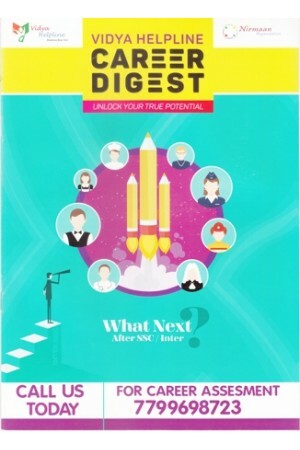 The current magazine is a wonderful compilation of important aspects about several careers from major streams such as Finance, Engineering, Management, Fashion Technologby, Agriculture, Pharmacy, Overseas education, Civil services, etc., This magazine also has a few exercises on exploring oneself, career puzzles, important colleges, scholarships, articles from renowned people etc., I can surely say this magazine, if used to its entirety, can help you lay a clear career path for yourself.